First time I tried these and I really like them. Get good distance and they react well on the greens. I would definitely buy more of these. I always use the prov1 balls and can't wait to get out and play these. Great golf balls for a fraction of the price. All of the golf balls look as if they were brand new.So far I've only been out a couple of times to use these pro V 1s and have only used a couple of them but so far they've had all the characteristics of new ones at a fraction of the cost.As of right now, I'm completely satisfied and glad I made the purchase. ProsHave both the distance and spin of a new ball at a much better price. ConsTough to say since I've only used a couple of them, but it seems possible that they mark up a little easier than a brand new one but you're still paying so much less, worth every penny. Looked great and played great. Worth it. They play as well as any new ball. Can't beat the quality for the price. Arrived sooner than expected . Great quality product and unbeatable price. Exactly as advertised can’t wait to get out and lose them! Great buy. The golf balls are mint. Have ordered these balls several times and always pleased. Balls in great condition and can't beat the price. Top of the line refurbished Pro V1s for an unbeatable price. I paid less for three dozen than some places charge for 1 dozen. This deal really made my day. All look good except 3 with visible scratches. We'll see how they play next week. A great value for the dough spent. Only a few ball were not mint. Thanks Caveman. Most of the balls are in decent shape while a few are terrible, but have not played yet to see how they will hold up. ConsSome balls have cracks and poor paint jobs. Don't look as good as other recycled balls. As others have mentioned, these balls look and perform as brand new. Out of 36, I found only one with very slight markings that were difficult to see. Well worth the price! The balls look brand new. Some look like they were hit one time. Perfect for the casual round. I would not purchase again. Out of the box these balls look like something dug out of a pond or found in the woods. The finish just does stand up to normal play. Can not speak to their performance as temps were in the 40’s when I played them and the distance probably was effected by the cold. These balls are just like new at a great price. How can you go wrong? I bought 3 dozen "mint" pro V1's. I expected a few may have some logos. I was disappointed to find every one had a logo placed there by the ball refinishing company. So if they are going to put their logo on the balls when they refinish them, the description should not say "may" have a corporate logo but should say "all have the refinisher's logo"
Balls, have obviously been repainted and stamped, its done very well and you wouldnt know unless they hadn't told you. The balls have zero flaws on them, all look and feel brand new, i havent hit them with anything but a putter yet, as i am in South Dakota in February, but i will be in Naples, FL next week and will have ample opportunity to use them. For $1/ball on Pro V1's this is an outstanding deal. This ball is very good for the value. I am a single digit handicap and it holds up fairly decent. The balls with the green leaf are by far a better quality. Unbelievable !!! Will never ever pay the super store price again!! Plus Rock Bottom Golf staff is the best to deal with. Balls are mostly pretty clean, few have scuffs, and one was cracked (don't know how that made it through qc). Noticed the ball aren't as white as new balls. 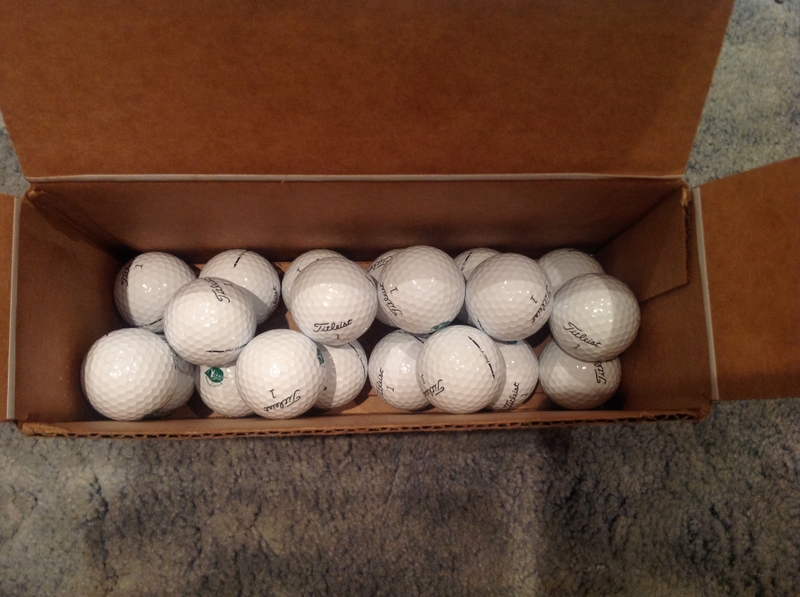 I bought a Box of the V-1 mint refurbished golf balls, every time I hit one the finish scuffed off. I have an 80 mph swing speed so it's not me. These are definitely not worth the money. I had to buy new balls. These are on the shelf because I hate wasting things, I guess expensive water balls. Merchant Response:Thanks for the feedback! The customer service crew has been notified of your issue and will be reaching out to help! I am sorry for the inconvenience. Very good pricing for the condition of the balls! You can't beat this deal. You get a quality ball without breaking the bank. Good distance and nice feel. You can't go wrong. Balls look and feel brand new. Can’t beat the price for the quality you get! Tried the Pro V1 refurbished golf balls and they played great. Best distance ball and stop on a dime with shots to the green. I have been playing these balls for almost 2 years now. They look and feel like new balls, and my wallet is fatter ! Very little, if any difference from "new" ProV 1's. They carry off the tee like new balls, and the spin control is great ! I would highly recommend these to any golfer that wants a high performance ball at a fraction of the cost. Game saver ! ProsLike new, fantastic off the Driver and irons, good control. I seriously am so surprised the condition the balls came in for the money...its a steal!! Virtually no marks on the balls and only have the printed logo of the company who refurbished them. The ONLY gripe i have is of the 3 dozen, they all have the number 1. So if i hit more than one off the tee, no telling which was which shot for sure. I have ordered these golf balls several times and have never been disappointed. They play as well as brand new at a fraction of the cost.